I often hear people say they don't read the newspaper. Contrary to what they might think, that statement doesn't come with the same aura of sophistication as when people say "I don't watch television" (and even that's often a misguided attempt at intellectual supremacy). But most likely, when people are saying they don't read the newspaper, they mean they don't read the printed edition. Many of you are reading the stories newspapers publish--you're just reading them online, either by going directly to newspapers' websites or from being led there by a link a friend posts on Facebook or Twitter. But if you're not even reading the newspaper online, shame on you. I haven't read a print edition of a newspaper regularly in about five years. I remember moving into my first apartment in my first city for my first job after college and buying a subscription to the local newspaper. I felt it was important for me to do as a professional journalist. Plus, I'm a news junkie so reading it was a form of information and entertainment. But when that subscription expired, I didn't renew it. It became hard to justify it when I had visions of stacked up, unread papers in my living room. As life got so busy, it became harder to find time to read the newspaper every day. I wouldn't want to crack open the paper because I didn't have the time in the evening to devote to reading it. Or I would pick it up and just scan the front page. Since then, which was around 2002/2003, newspapers have greatly improved the quality of their websites and the quantity of stories they publish to them. 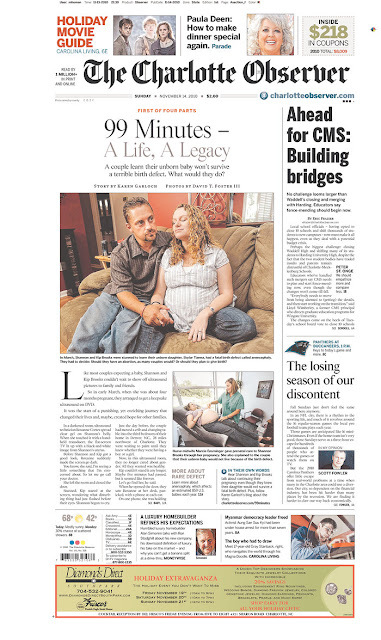 Having lived in Charlotte now for the past five years, I read The Charlotte Observer every day...online. On a typical day, I'll visit CharlotteObserver.com at least five times, from morning to night. I look forward to the updates they make to the homepage, and it's how I best stay informed on what's going on around me. Unlike some people I know, I've never doubted the importance of a quality local newspaper. Sure, it's vital to the industry I work in, but it's even more important to local residents. And The Observer is important to everyone who lives in Charlotte, whether they realize it or not (and I'm not getting paid a dime to say this). The importance of the newspaper has become abundantly clear over the last few weeks through The Observer's coverage of what's happening at Charlotte-Mecklenburg Schools and the proposed school closings. No other media outlet is covering this issue more thoroughly than The Big O. Stories about CMS and the concerns of the community have been on the front page of the printed edition most days during the past month. And The Observer has built a newsbank of information on CMS on its website. You'll find a database that features a profile on each school, which includes demographic breakdown, number of suspensions, etc. There are databases on CMS salaries and a directory of board-certified teachers, as well as a listing of contact information for each CMS board member (should you be inclined to take this issue seriously enough to want to contact them). And all that's in addition to the day-to-day news coverage, such as recaps of school board meetings, analyses of school funding, and details on exactly which schools are on the closure list. Again, no other media outlet is providing information this extensively. Not your favorite TV station, and certainly not your favorite blogger. For an issue as controversial and divisive as the school closings has become, people need to be informed. Regardless of what side you're on or what views you have, your opinion should be formed after knowing the facts. And without The Observer, there would be even more less-informed people running around. That would be even scarier. The Observer, as do most newspapers, has to figure out a way to remain profitable, even after laying off a large percentage of its staff. With so many of us reading the stories online versus buying the paper, that represents declining revenue in itself. Plus, as most of you are aware, businesses aren't advertising like they used to, so that means declining revenue for the newspaper as well. I covered all of these challenges facing The Observer in an article I wrote for Creative Loafing that was published in August ("Remains of the Daily: What's left of — and what's next for — The Charlotte Observer?"). You should go back and read it--which you can do online, of course--if you haven't. And on my final statement from this soapbox, I'd like to also point out that companies need to get back to subscribing to The Observer. Yes, that would increase circulation for the paper and bring in more revenue, but I'm advocating it on behalf of every day employees. Reading the newspaper in the break room used to be a ritual for many, but it has largely gone to the wayside as companies have cut out "office perks" like newspaper subscriptions (and free coffee). As someone who is self-employed, I've come to understand bottom lines really well, so I know companies have had to make cuts during the past almost three years of this difficult economy. But as the economy slowly returns to a better state, I hope businesses will begin bringing back newspapers to their break rooms and lobbies, for that matter. We can't afford to have a society of uninformed people--no matter how much they tweet.